Thomas J. Bamrick is the Chief Operation Officer of Area 2 of the Early Learning Coalition of Southwest Florida. 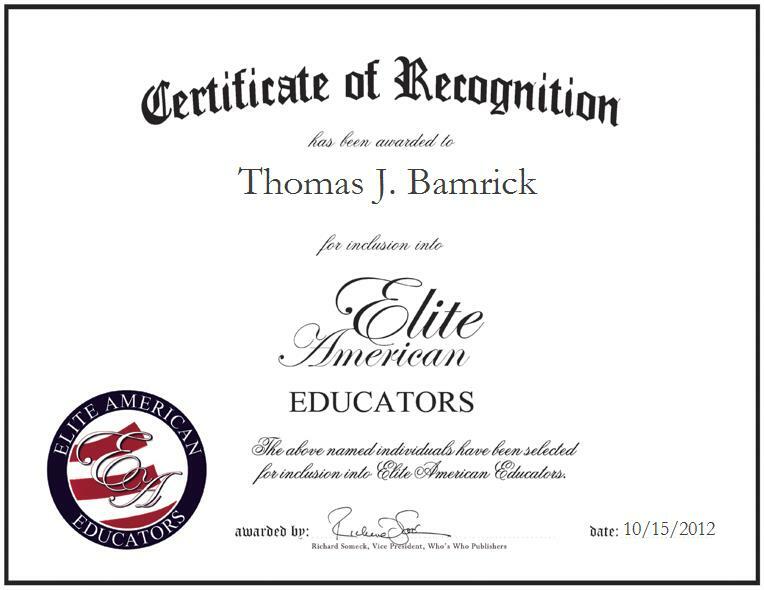 For nearly four deades, Mr. Bamrick has been building on an expansive skill set, which currently encompasses strong proficiencies in communications, partnership building, fundraising, children’s advocacy, and the collaboration with state and federal legislatures. In his current capacity, Mr. Bamrick is in charge of working with nonprofits, private and public schools, social service organizations that aid the youth and families, early childhood organizations, and volunteer organizations, and he also oversees all major programs for the coalition, looks for providers, and provides a quality development program for child care providers. He has garnered a reputation of distinction for bringing people and programs to the forefront. Mr. Bamrick is a recipient of the Naples High School Volunteer of the Year Award, and he has also received Odyssey of the Mind’s Center for Girls Award, and PACE’s Volunteer of the Year Award.